Spangle was bred by Jenny Arber being sired by Sh Ch Tweedsmuir Subaru of Brauncewell, out of Tweedsmuir Bedazzled at Brauncewell. Spangle loves everyone and everything, and refuses to believe that visitors have come to see anyone but her. She 'woo's (actually it is more of a 'rrrrrrrr' because she usually has a toy in her mouth), and she has a ball fetish like our previous Clumbers. She is also a good snorer! She was only shown lightly during her puppy hood, but still managed to notch up some Best Puppy awards. She made a wonderful nanny to Donna's (Grand Basset Griffon Vendeen), first litter; she was so gentle with the puppies and absolutely adored them. 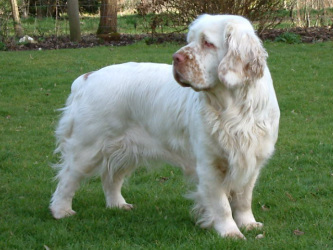 In May 2010 she had a litter of three girls sired by Sh Ch Vanitonia U Bet I Am (Rupert). As expected she made a wonderful mother. From that litter we kept Phoebe.